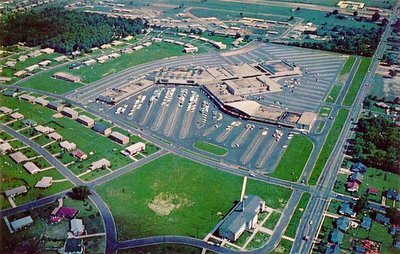 Visible nearby to the North East on the aerial link below, is Desoto Square Mall. 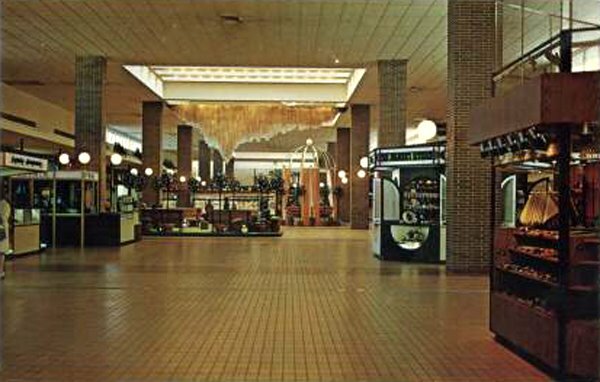 View looking towards a portion of the River Oaks Center Mall, around the time it first opened. A Fabric Mart store can be seen on the right, as we gaze past a central open-air court area. 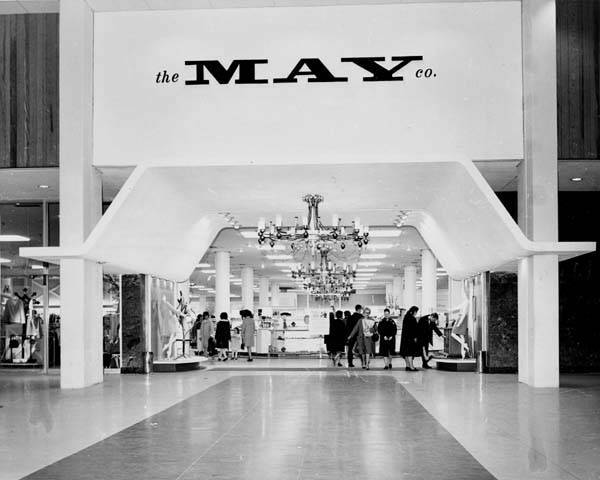 See the Wikipedia link below for the full history of this mall. 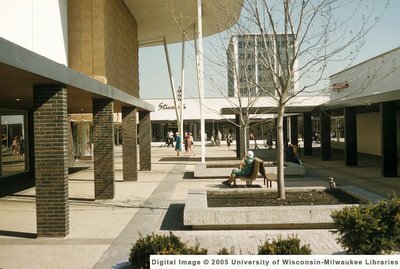 Thanks very much to, Paul Mcvay, for submitting this great shot of a mall I've not yet covered here! Behold, a vintage '70s Korvettes store commercial! And get a load of all the groovy old stereos, radios, TV sets and stuff! 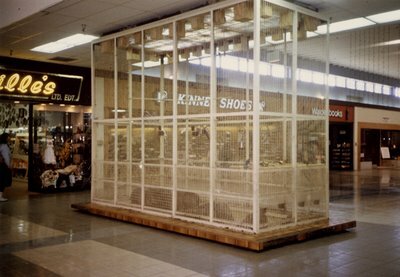 Yep, this was back in the day when going to the store was still cool. Dang cool. 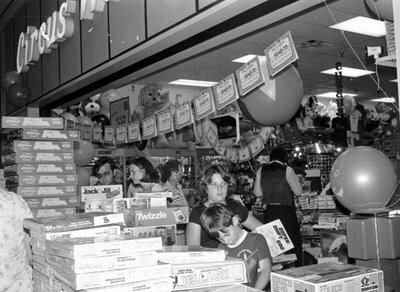 And Korvettes discount stores were some of the coolest around in their day--at least to my young eyes they were. Note: Video is Flash format. If you don't see it, you must temporarily disable your ad-blocking programs. 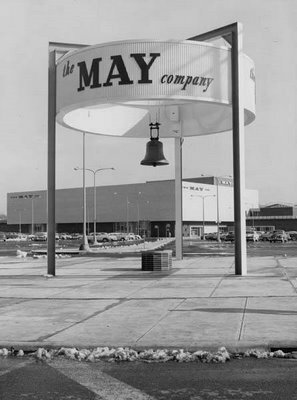 Wonderful old May Co. department store sign (with bell!) in University Heights, Ohio. What a great and unique design. I had never seen one like this before (but then, I've never followed May stores much). 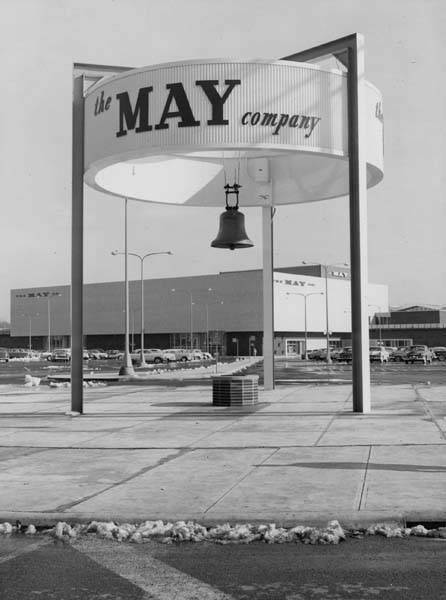 According to this info at Wikipedia and elsewhere, it appears that (if I'm piecing it all together correctly) this original May store became a Kaufmann's in 2002, and is currently being converted into a Macy's (Wikipedia shows 9/9/2006, as the actual finished conversion date), as the enitre site has undergone a complete redevelopment to form the new outdoor regional shopping center, University Square. Or something like that anyway--it's quite a tangled web, this story, lol. But the logistics and dates aside, I just thought this great sign was worth gazing at today. 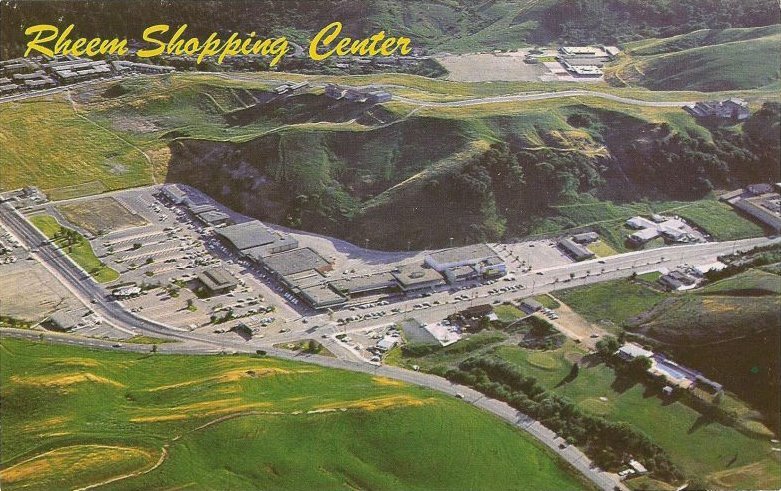 I was told this postcard depicts the East Hills Shopping Center in "Orem, UT", but I can't find any reference or shred of evidence online, showing it ever existed there. The main one that turns up in all my searches is a mall by the same name in St. Joseph, Missouri, no mentions anywhere of one in Orem. Weird. I wonder if the person I got this from is mistaken about that. But I'll go with this information till I hear otherwise. So does anyone out there know for sure if there ever was (is?) an East Hills Shopping Center in Orem, Utah, at least into the 1970s (or before)? If so, then there certainly doesn't appear to be much info about it online. Consequently, I have nothing to list below for its history. If it turns out to be the mall in Missouri, I'll update this post with that mall's reference information later. Probably one of the coolest shopping mall entrances I've seen! 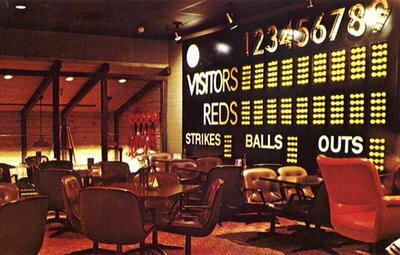 And even though I'm sure this great sign isn't still around, at least the memories, and photos like this, are (thanks to MOA reader, Doug Riley, for the tip on this shot!). 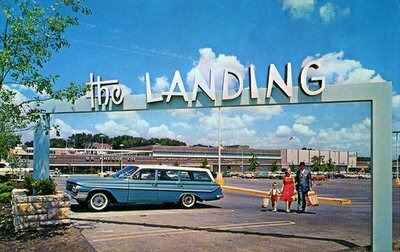 As for this mall, The Landing, I couldn't find much more than passing mentions of it online, nor could I spot an official website either, so I don't have a lot of info to add for it. If anyone else knows more, please comment or e-mail me. Anyway, the above postcard comes from this Flickr set, and while I personally don't much care for Flickr as a photographic presentation platform (which is why I blog and don't choose to put my stuff on there, as some have requested I do), there are some nice vintage roadside photos in this collection, nonetheless! I'll note that I did do some overall spot-removal and cleanup on the original image, as well as some color/contrast adjusting, as the scan was a little too muddy. I think it looks better now. Hmm... Sort of strange looking fountains in Deptford Mall, aren't they? Still, cool little array, though! I really like how they have the fountain basins tiered like that. You can barely see a larger one just out of camera range in the foreground underneath the smaller two. Nice. Wonder how they looked at night (and are they still there?). This colorful postcard image features a beautiful fountain outside of Dadeland Mall, in Miami. "I noticed you had a copy of the mall map from 1966 included in your post. It looks as though someone has altered it a bit, for some unknown reason. 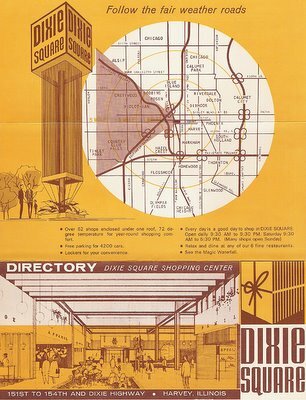 I have included two attachments here of a fresh scan I did today of the same mall map but this one is from 1968. This map has previously not made the rounds online and infact isn't even available on anybody's website because the only remaining copy is in my posession. 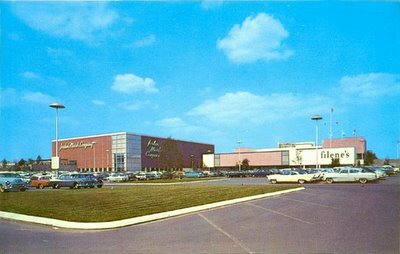 I thought I would share it with you and the Malls Of America group before anyone else. The map differs quite a bit as far as the store listings and is a much better scan than the 1966 version (which originally came from Harvey, Illinois Historian Debbie Lundmark and has been copied a million times since she originally scanned it about 6 years ago). Hope you and the Malls Of America group enjoy it." 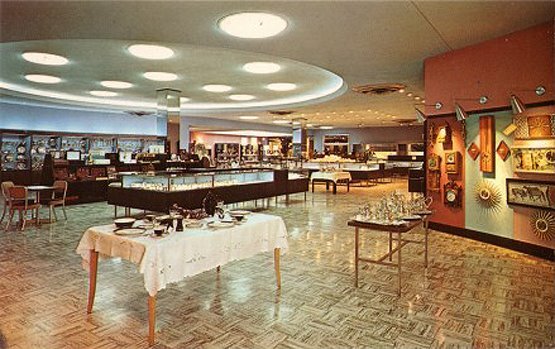 The sparkling, swinging '60s interior of the Stevens & Son jewelry store in Lloyd Center Mall, dubbed in those days: "The world's largest shopping center jewelry store". Bet there's a lot of great vintage bling in there. Found this short vintage 1960s public domain footage of a woman browsing in an old dime store, it appears. The original film is silent, so I thought it'd be fun to add some music to it and see what happens. Much better, I think. This film actually has the title, "Dollar Store #2", attached to it by whoever uploaded it to Archive.org, but I'm not so sure about that. 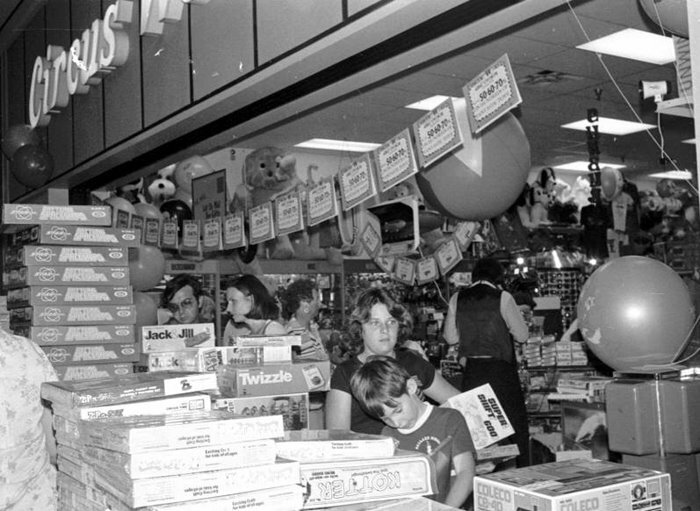 It looks more like a dime store to me, so whatever, at least for the purposes of my little video mix, I dubbed it, Dime Store Odyssey, which sounds cooler than Dollar Store #2 anyway. You can tell this was actually raw footage, probably taken from a local TV commercial shoot, as the woman just kind of walks aimlessy around the store touching stuff, and most of the shots get numerous takes one after the other. Not too exciting to some maybe, but the old store interior and merchandise is pretty cool to watch if you ask me. Nothing fancy but I hope you guys dig it! 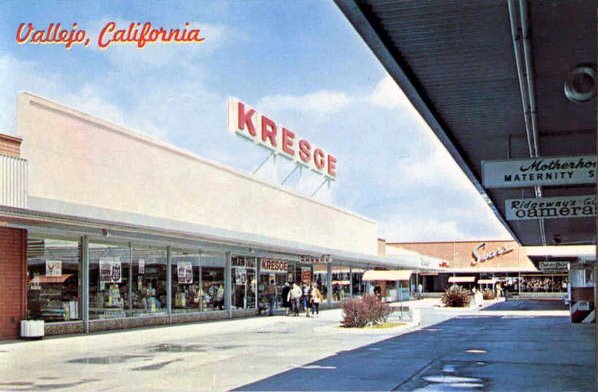 Here's a picturesque little scene outside the Kresge and Sears stores at the old Larwin Plaza, which is now called Vallejo Plaza Shopping Center, as far as I can tell. 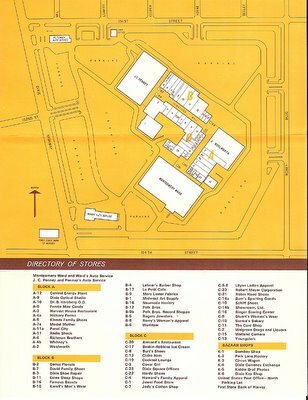 Found no official website for the place, nor any information re: the year it originally opened (under the Larwin Plaza name), but I believe the name was changed to Vallejo Plaza around 1981, according to the Retail Traffic article I cite below. At any rate, it's a pretty nifty shot, that much I do know for sure! Colorful little shopping center (especially that groovy looking GC Murphy Company store! ), that, while not really an enclosed shopping mall, still looks cool enough to post here, me thinks. 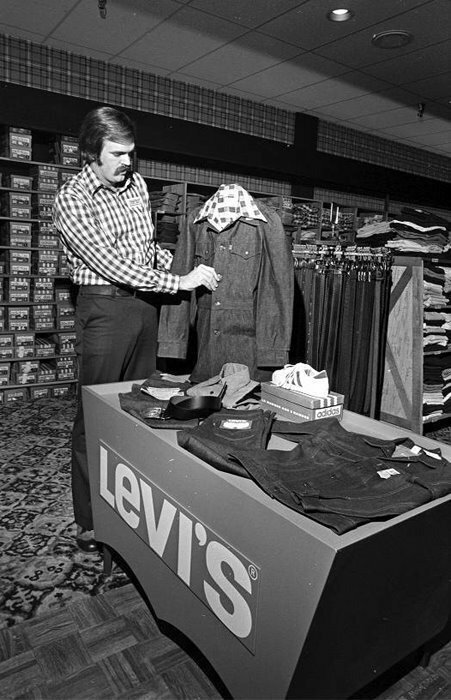 This guy's here to chew bubblegum and wear denim--and he's all out of bubblegum! Yeah, in the 1970s, real men wore flannel shirts and denim jeans--and this County Seat clothing store worker in DeSoto Square Mall is certainly up to his armpits in it, as he tends the Levi's stock. Apparently he's not only the manager, he's also a client. 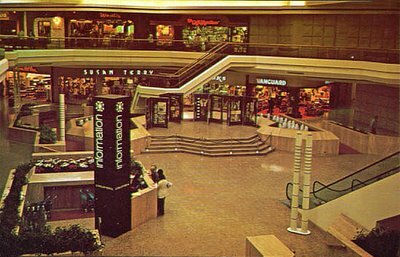 Feel free to dig into past entries and add to the latest discussions and information yourself, so the archive of shopping mall memories and details here will continue to grow and be even more useful as a resource for vintage-era mall information and first-hand accounts. 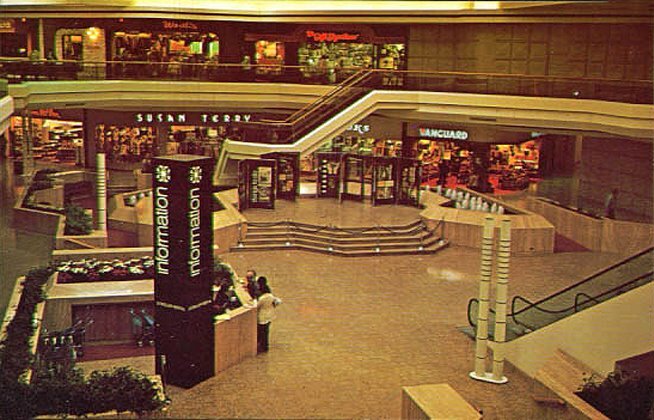 Here are shimmering examples of what class used to look like at the shopping mall. 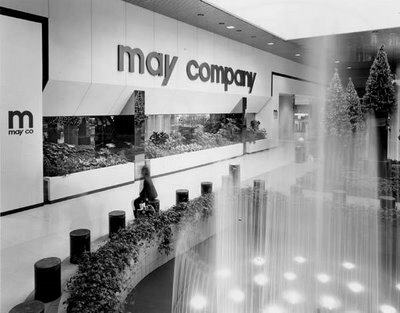 I give you two different views of the entrance to the May Co. department store in Parmatown Mall--one from 1968, and one from 1981. The first photo certainly reflects a more '60s vintage-era design aesthetic and feel, while the second, looks more modern and groovy, almost spacey, coming out of the 1970s. You should be weeping now looking at these. 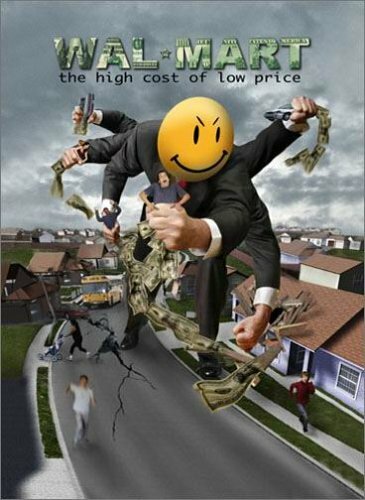 "Wal-Mart: The High Cost of Low Price"
Fascinating 2005 documentary by Robert Greenwald, about the Wal-Mart chain and their dominance of the American retail landscape. People differ on which side of the fence they sit on this one--some love the Wal-Mart, some just loathe it--I'm simply putting the film here for your own consideration and study, and leaving the conclusions up to you. There are valid points on both sides of the debate, of course. Personally, I'm on no vehement crusade, particularly, to have all Wal-Marts everywhere shut down (like some people are--and more power to ya), but obviously, as a lover of all-things-vintage in this world; from the local American malls and stores I grew up with, down to retro architecture around town in general, I don't dig the idea of the same generic behemoth chain store sitting on every stinkin' corner you look--especially, especially when they have to demolish all my beloved old shopping malls, local corner stores, and drive-in theaters to do it! Uh-uh. That's where I do draw the line personally. So in that sense and in those circumstances, yes, count me as against a retail "blob" rolling across the world and putting everyone else out of business, gobbling up all the land and old buildings in its fat, blobby path! Yeah, I'm against that. But anyway, wherever you stand on the issue, this is a very interesting and fun documentary, nonetheless, and does have a bearing here at MOA, as we struggle to answer the question many of us ask ourselves more and more these days: "Where are all the shopping malls going??!" Well, the truth is, many have been (and are being) demolished to make way for more Wal-Marts, man. 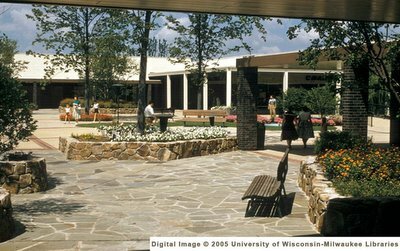 Here are two very choice retro photographs, showing some of the famous courtyard areas at the Oakbrook shopping center in 1962. Update: Made a date correction on the first picture. Both are from '62. And now for something completely different. Here's a really cool video I came across recently, of the Bellevue Square mall, modeled in 3D, utilizing the Unreal Engine, which is a video game engine used to power the popular computer action shooter game of the same name, Unreal Tournament. It [the map] was put together by students at Bellevue Community College, in Washington. Now I'm a huge computer game fan & player (have played more than my share of UT2004, among many others! ), so this is right down the old snot-locker for me (sorry, that's pilot talk. I've also played too many air combat games over the years as well, hehe). Anyway, I think it's pretty neat, especially considering the fact that I've long been doing "virtual" mall map experiments along these same lines myself over the years, using several different gaming engines--with varying results. 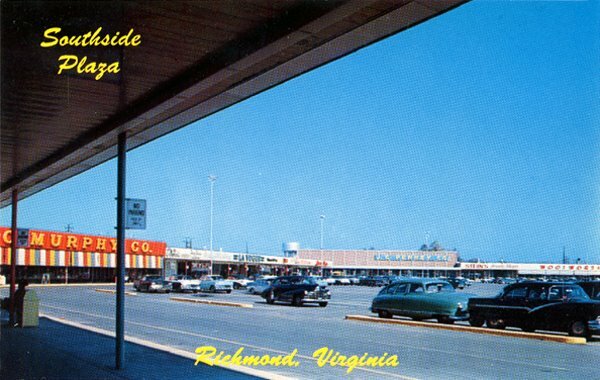 "For all those familiar with Montgomery, The Normandale Shopping Center is the place to shop and has its presence deep in the fabric of Montgomery culture. With aggressive new management and leasing, The Normandale Shopping Mall is pleased to present this opportunity to retailers to become an anchor in the most recognized and famous shopping center in the area. The Normandale Shopping Center, built in 1952, was Alabama's first shopping center and continues to be cherished. The new national Ownership has big plans for the area, owner has received permits to build 64 upscale townhomes adjacent to the site as well as to expand the shopping center." Northshore Mall (formerly the Northshore Shopping Center) is one of the largest shopping malls in New England, and this vintage postcard certainly captured it looking swell and on one heck of a beauiful day! Stores visible are a Filene's on the right, and a Jordan Marsh Company anchor store on the left--dig their nice script logo! "Riding the escalators at Famous-Barr in Downtown St. Louis. You will notice three different types of escalators. First, a modern Schindler escalator (used for floors 1-4) with glass balustrades, no more than 5 years old. Next, an earlier Westinghouse model (floor 4 to 5)with steel art deco-style balustrades and design. Finally, two wooden Otis escalators (Floors 5 to 7), possibly from the 1930s - wooden escalators but with steel steps. 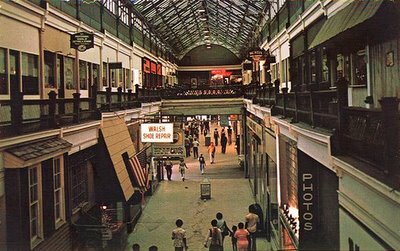 Ever since my childhood, I've loved riding the many escalators in the big old downtown department stores - St. Louis is fortunate to have this one. This store is set to be rebranded as Macy's this fall as a result of the Federated-May merger." Opening in 1903(! ), the enclosed two-story Nashville Arcade, inspired by the Galleria Vittorio Emmanuele in Milan, Italy, is truly one of the nation's very first indoor shopping malls if ever there was one! And not much has changed there over the many years. Postcards and photos that date from its opening days and on into the '20s and '30s, all still pretty much look the same as this photo here. Big Town, the first enclosed shopping mall in the Southwest, as well as the first enclosed, air-conditioned mall in Texas, began its date with destiny (the wrecking ball) last month, as wrecking crews began demolishing the structure. They estimate the job to be completed in September. There are no plans to redevelop it, nor any decision yet on what will take its place at the site. 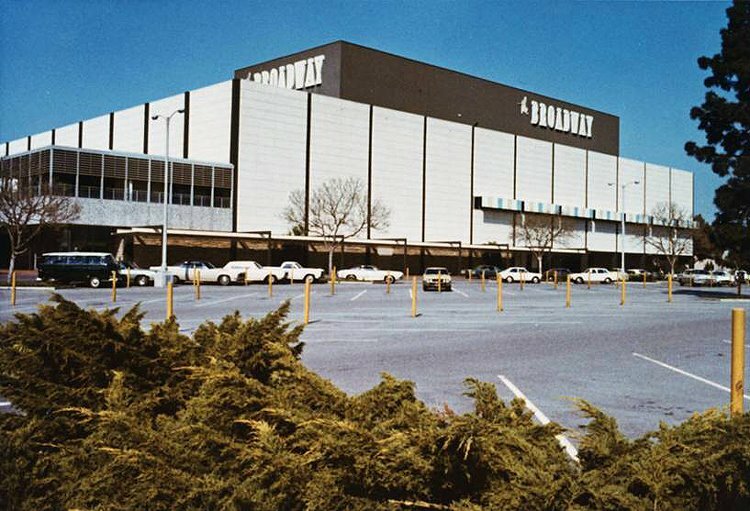 Thanks to MOA reader, Howard Wen, for the head's up on the demolition! I enlarged the small interior inset photo on the postcard, so we could get a little better look inside. Also noticed this place had a great sign, too! See the Resource links below for in-depth history and info. Boy, I hate to see the old classic go. Just love this shot of the Rheem Shopping Center, nestled in the lush and picturesque (back then anyway) Rheem Valley. One of the more unique looking settings I've seen for a mall or shopping center--like the Gulf View Square Mall, for instance, which sits right on the edge of (and almost into!) the Gulf of Mexico, in Port Richey, Florida. "The Broadway department store and the outdoor center opened in 1955 [online sources indicate 1954 --Keith]. 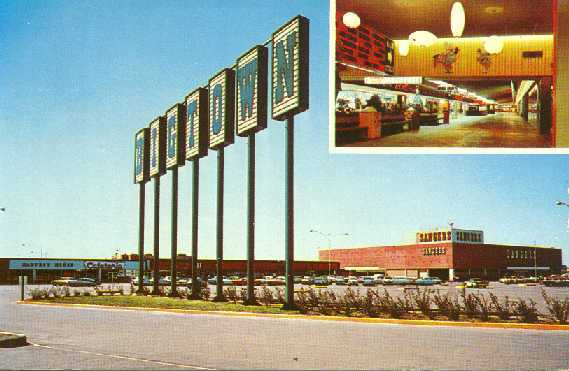 Robinson’s opened in 1963. 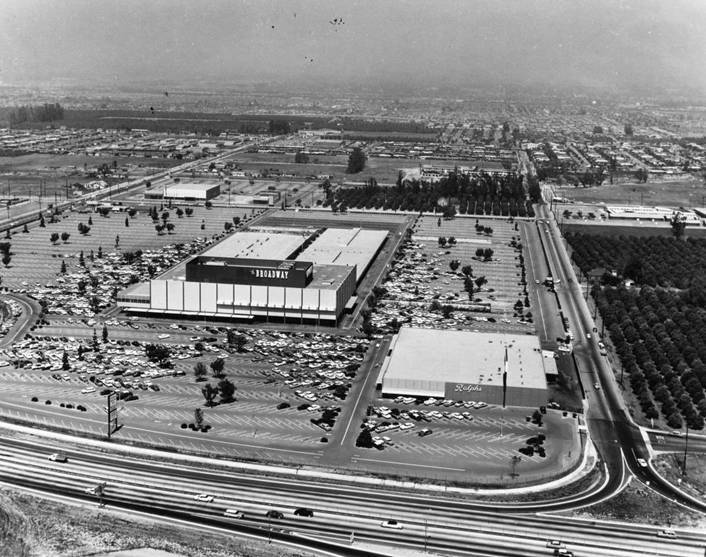 The mall was enclosed in the mid-70’s and did well up until the Bullock’s Fashion Square (1958) in Santa Ana was enlarged, enclosed, and renamed MainPlace Santa Ana in the mid-80s. Robinson’s abandoned their Anaheim store in favor of MainPlace and Anaheim Plaza started its slow decline. The Broadway closed in the late 90’s and the entire mall was bulldozed. Today, it’s a power center." And here's a beautiful aerial view of the place. 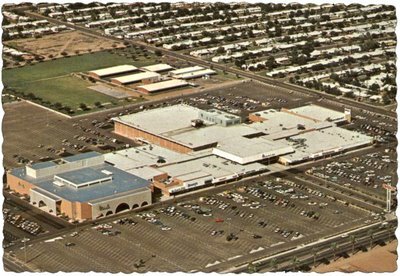 Additional background info on this mall and its "de-malling" redevelopment can be found at the Resource links below. 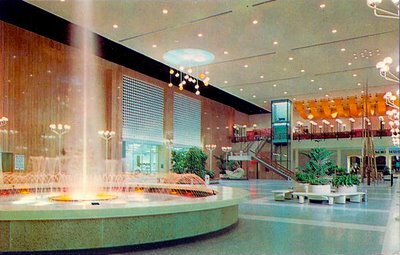 Another stunning shot of the incredible "Wonderfall" water fountain and retro interior of the Palm Beach Mall! It just doesn't get much better than this, if you ask me. 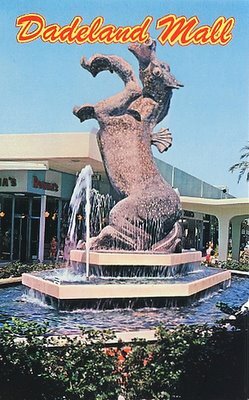 "A Florida landmark, the new Palm Beach Mall houses 87 stores including three department stores and nine restaurants. 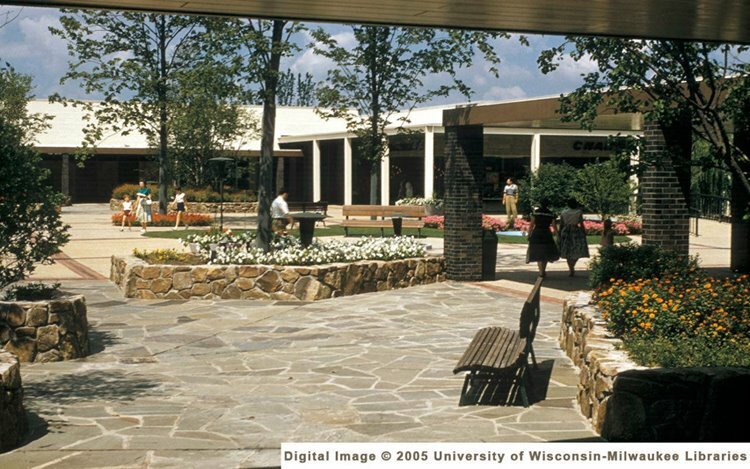 The beautiful illuminated Wonderfall is the centerpiece of a completely enclosed and air conditioned plaza. 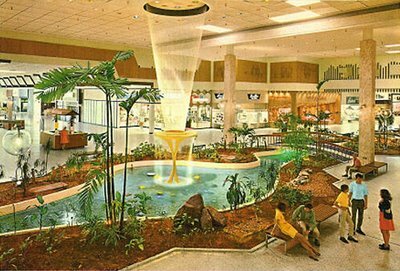 Such luxurious shopping facilities combined with the fabulous Florida climate guarantees a holiday that will never be forgotten by the millions annually that come here." Vintage interior of the Gulfgate Shopping Center, which has also gone by these names over the years: Gulfgate Shopping City, Gulfgate Mall, and finally, after a 2001 demolition/redevelopment, Gulfgate Center. 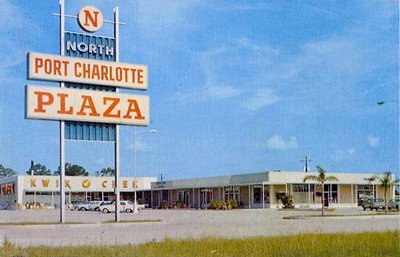 So really, it's a whole new mall now (or "power center" as the developers have referred to it), with the old Gulfgate completely razed to make way for the new. It's now "Gulfgate" in name and physical location only. The place will never be the same. Or as cool. 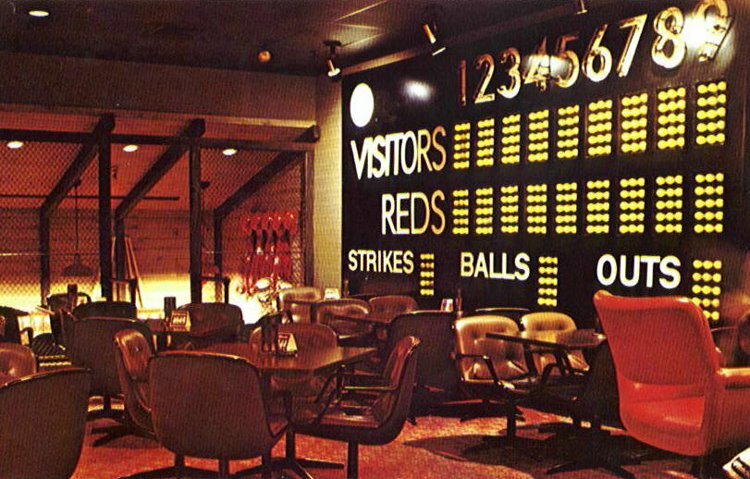 Stylish and swanky interior view of Johnny Bench's Home Plate restaurant, in Northgate Mall! Northgate is currently undergoing a major new year-long renovation makeover project that kicked off in April of this year, and is estimated to be completed by Christmas 2007. 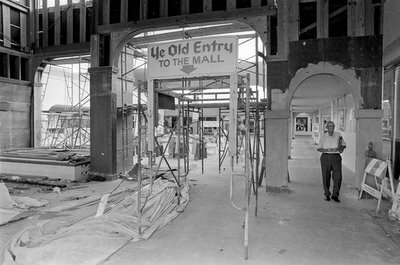 The mall has seen a few minor updates over the years, and one other major renovation (in 1992) during its lifespan so far. Yep, I'm sure by now every last drop of vintageness has long been squeezed out of her. I like me a good shopping center sign now and then. And that's what this photo is all about, the sign. For all I know this plaza was just a little strip mall or something, I'm not really sure (hardly anything informative about it online as far as I could see), but I just enjoy the bold signage design. Feel free to dig into past entries and add to the latest discussions and information yourself! 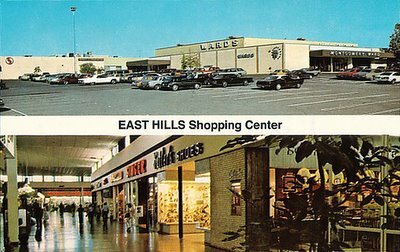 That way, the archive of shopping mall memories and details here will continue to grow and be even more useful as a resource for vintage-era mall information and first-hand accounts. 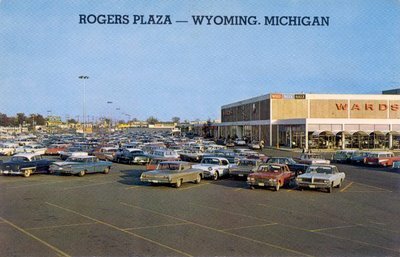 Cool vintage shot capturing a little of the Montgomery Wards anchor store in Rogers Plaza mall, which is now known as the Rogers Plaza Town Center, after a major 2002 renovation/redevelopment makeover. Pretty obscure little mall, actually. This is a repost of an earlier photo I ran last year. 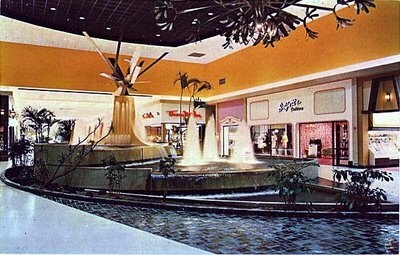 The beautiful interior of Belden Village Mall (now called the Westfield Belden Village, if you listen to The Westfield Group). 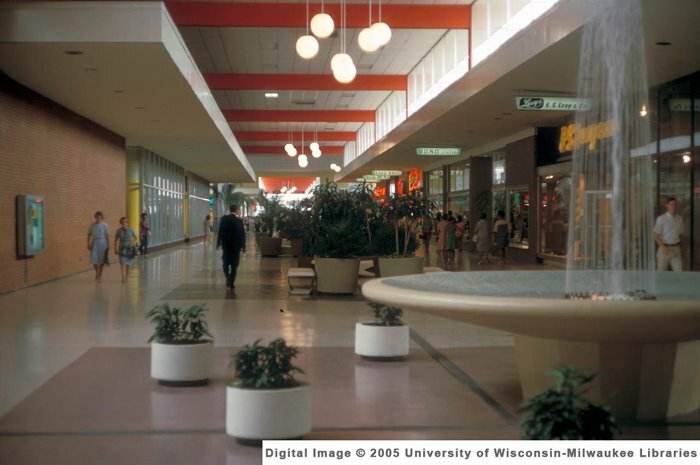 This is an upgraded, color-corrected version of my previous photo, that is much more accurate as to the actual true color scheme of the mall circa the early '70s, at the time of this shot. A very noticeable difference if you compare the two. 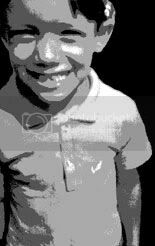 "I color-corrected your picture. 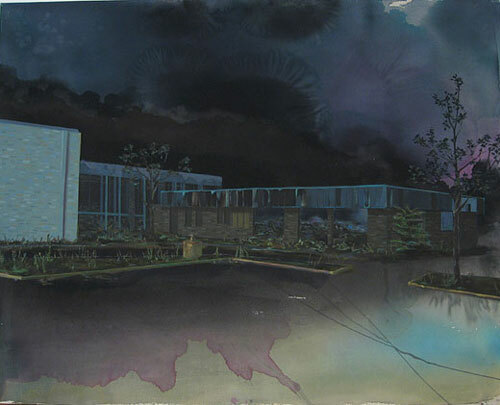 Not only did I work there at one time, but the original architect is a friend of mine, so I remember it well. While icky Harvest Gold was certainly a part of the color scheme, it was not the only color. 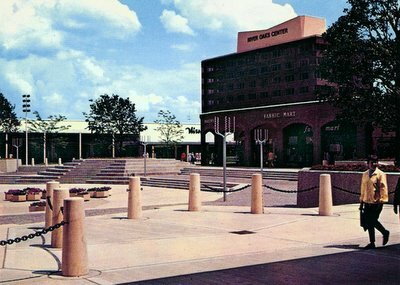 That appears to be BVM as it was originally designed and remained from 1970 to 1983 or so. 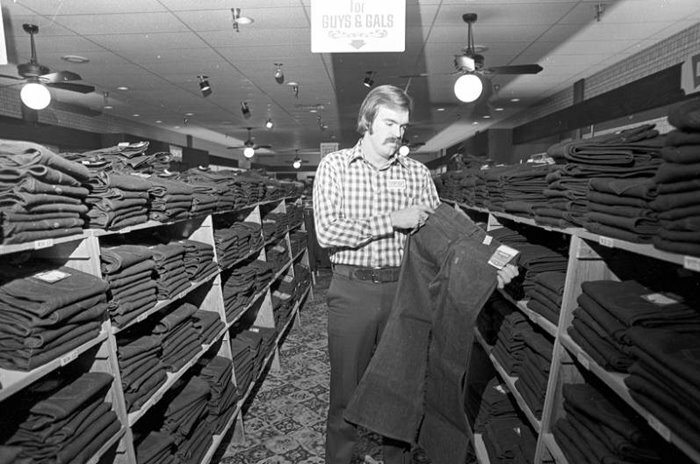 There have been several “remodels” the most sweeping in the mid-80‘s." Again, thanks JP! Now if you could just tell me the name of the architect, and maybe the definite year this mall first opened if you know (looks like 1970, from what you said), then I'd be all set. Thanks to my friends at rollingacres.org (a great site that will be in my sidebar links soon, btw), for this terrific submission of the famous Lloyd Center Ice Rink, in the Lloyd Center shopping mall! 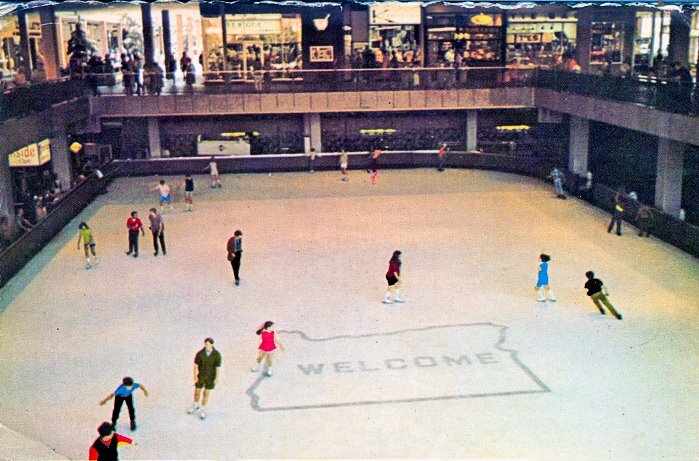 Happily, the rink is still there today and going strong, which is nice to know, as some shopping malls that actually had them, got rid of their ice skating rinks back in the '80s and '90s (usually in lieu of a food court). 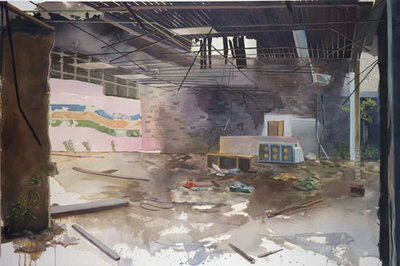 Many thanks to Geoff Manaugh, of BLDGBLOG, for giving me the heads up on this wonderful work by Brooklyn-based painter, Angelina Gualdoni. I love it! 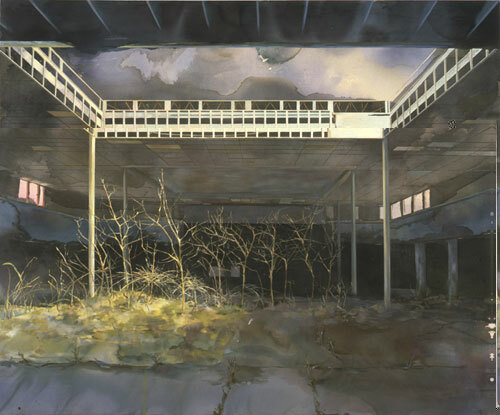 Gualdoni paints eerie, haunting impressions of urban decay (and the promise of renewal). For our purposes here, I'm showcasing specifically, her abandoned shopping mall paintings of Dixie Square Mall. 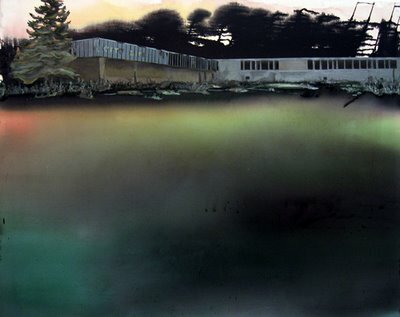 All are oil and acrylic on canvas. You can read more about the artist and her Dixie Square paintings in particular, in this entry at BLDGBLOG. The first two videos are from the Metreon mall in San Francisco, the other wasn't specified. One thing's for sure, though; wherever these things are installed, the people seem to love 'em. Mission accomplished for the shopping malls I guess. 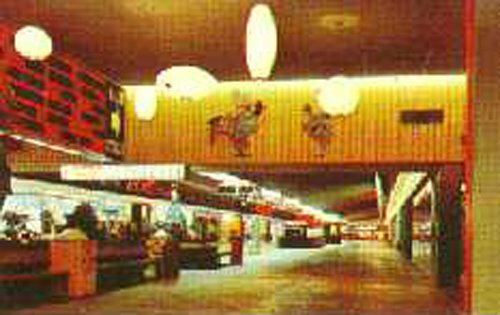 Vintage interior view of Glendale Center (now called Glendale Mall, after a grand re-opening in 2000). This mall has undergone major renovations and redesign in the past few years (even adding a public library branch to the interior, which you can read about here), so I doubt it looks anything like this Earth-toned vision anymore--though their redesign purportedly pays homage to their retro original '50s look, which I like the sound of. In this shot, I can see what looks like a bird (or monkey?) cage down there just to the right, in the center concourse. But what the froog that hanging rug thing is supposed to be above it, I have no idea. If you zoom in, it appears to possibly be hung on a roll, like a shade or movie screen, but what decorative or useful purpose that would've served (especially considering how tattered it looks), I don't know. Maybe it was simply a partition type curtain they could pull down when they had something going on there in the court area, but man, it sure looks ugly and strange hanging there, lol. Maybe someone out there can enlighten me? 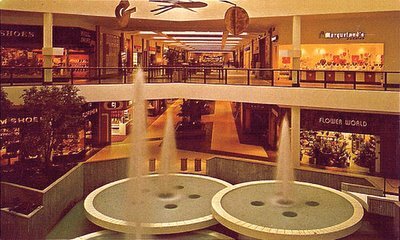 This is a view of the pool and fountain in the East Court of the Westland Center mall. Truly an incredible interior. 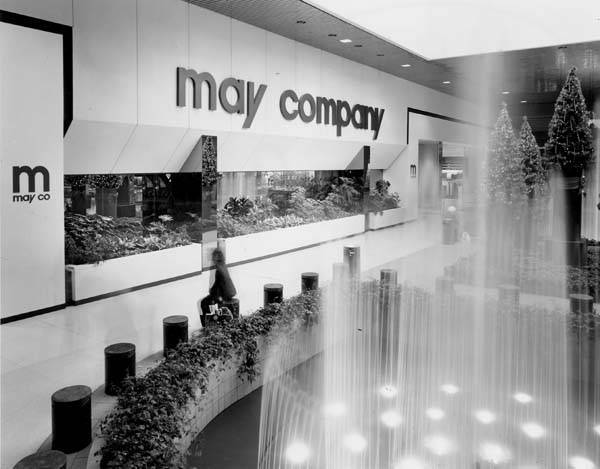 Wish I'd have had a chance to see this shopping mall in person back then, in its golden heyday. 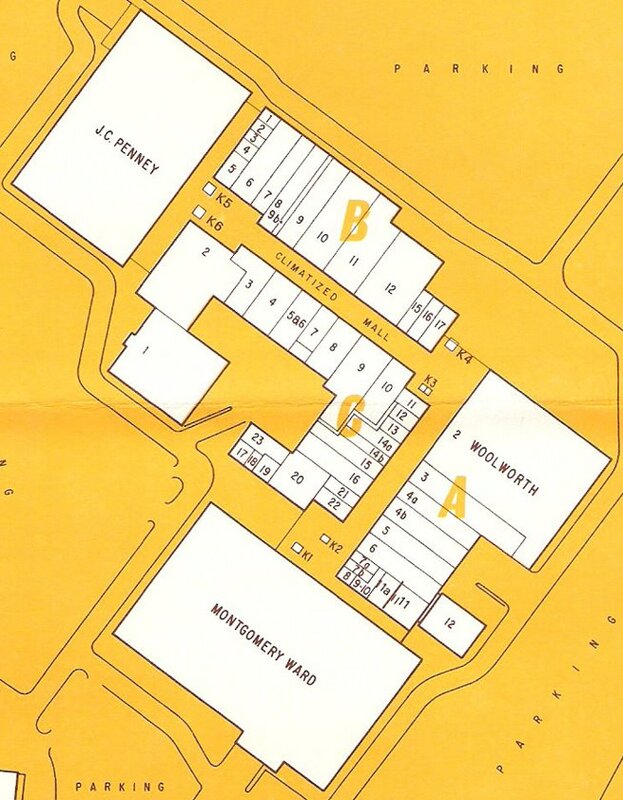 "With two main courtyards, a connecting mall and seven arcades, plus a concourse with many smaller stores and public service facilities, shoppers move through the entire Center in air-conditioned comfort. The many sculptures and works of art, along with the beautiful paintings, add to everyone's enjoyment of the Center,"
I like the muted colors, tone, and lighting captured in this shot. A certain overall tonal balance here that really speaks to me for whatever reason. 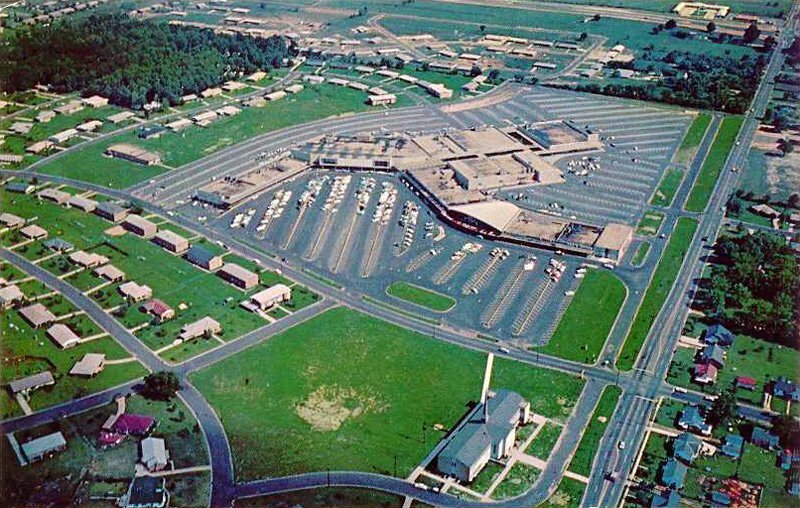 Vintage-era aerial photograph. 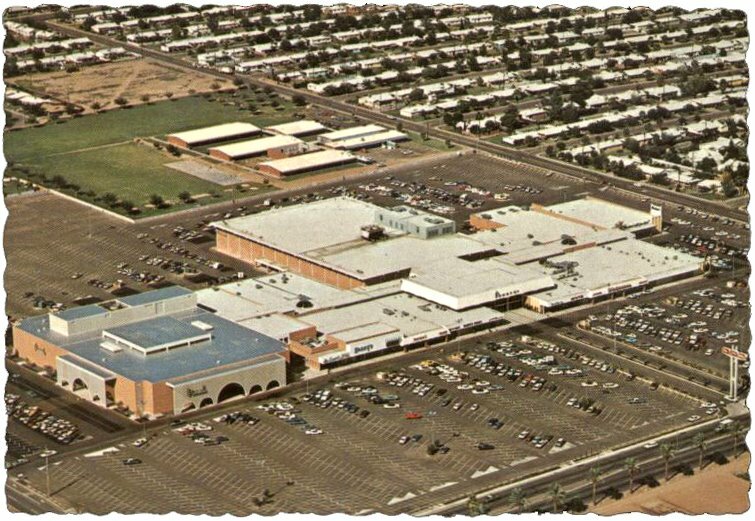 Last I read (articles cited below), this mall has been demolished to pave the way for a proposed light rail transit station on the same property. Tri-City Mall is no more.